There is a downside to living in a second (third?) tier town: movie releases. Sure sure - you'll get the flicks that open at 4,200 theaters in a week, but you don't always get the year-end / Oscar contention movies. Those go to L.A. and NYC to make the cut-off date. In places like Cleveburgh, we get those movies in early to mid-January. I'm looking at you, I, Tonya, Call Me By Your Name, the Post, the Phantom Thread, etc. We do have the high-regarded movies like the Darkest Hour (Spoiler: England TOTALLY(?) wins the war! ), the Shape of Water (does not sound appealing to me and getting very mixed reviews from friends). We could not agree on seeing Downsizing (though we like Alexander Payne), but could totally agree not to see Pitch Perfect 3. That pretty much just left us with Molly's Game. This was fine actually, as it is one we both kind of wanted to see. For the most part I like Aaron Sorkin's work (though if I never ever ever have to see An American President again, I'm very ok with that). We both like Jessica Chastain's work - though 710 likes her better than I. Make no mistake: probably upon his insistence, Sorkin's writing is the star here (and of anything he's involved with), the actors are just semi-bit players. Molly's Game is movie "true" story about running (or having run) a long-running underground poker game for the rich. A true story, though I have to believe with some tweaks. Don't worry - it's as much about poker as Moneyball (also Sorkin) was about baseball. It's more about people and their drive and /or flaws. It's Sorkin, so it is a talkie movie. And since he also directed it, no one is there to reign him in. Not bad for a directorial debut. Chastain does a fine job with the script and what few scenes she isn't in, she narrates over. She has voice-over in about 50% of the film. Like I said: talking. While I can't say I'm a fan of Sorkin, I know his work well enough - because my memory retention - that themes spill over from one script to the next. His need to citing facts that aren't really relevant to the story, but he likes to tell them. He did it in the Newsroom and West Wing, and he does it here. 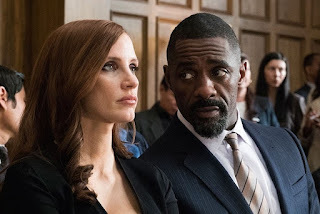 And because I'm me, I happened to notice that Idris Elba's character at the same law firm that Sam Seaborn (Rob Lowe in the West Wing) was a partner. It's hell being me. The first two-thirds of the movie are great - it moves along well with current day and flashback scenes. The last third is ok but some of it is just rushed-through. There is a clumsy metaphor of Molly skating in Central Park and an even tidier bow wrapped up out of nowhere with her psychologist father (Kevin Costner). It's another Sorkin-ism to have someone with the answers make the person ask the questions...........and they're always the right questions! Chastain pretty much carries the movie and I can only think of 1-2 scenes she is not in. She's a strong performer. There are a few scenes where she doesn't even look like herself. Elba is fine, but there is nothing so outstanding about his performance and for me, too many unanswered questions to his motives / decisions. You won't find anyone with lack of verbal skills in this movie, even the rubes, the Russians and Italian mafia folks have excellent verbal skills. Molly's Game pushes the 2.5 hour mark. They probably could have scaled it back by 15 minutes. No doubt Chastain will get an Oscar nod, but so far I think Frances McDormand out-performed her for the win. Yes, this was our last 2017 movie. Way off the goal. Even off the pretend scaled back goal of 12. I think we will stick with 12 for 2018. I want to see this but it's showing at an awkward venue at an awkward time - and your verdict hardly convinces me that it'll be worth the effort. Nonetheless, if I don't try it's going to be one of those nagging things, so let's see. ('3 Billboards' in a fortnight, probably). If you're in a 2nd or 3rd tier city, I must be in a 9th or 10th tier city. None of the films you mentioned is playing here yet. Sigh.